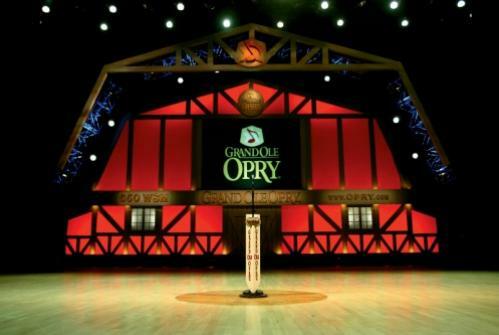 Earlier this week, country singers including Opry members Brad Paisley, Blake Shelton and Darius Rucker, along with frequent Opry guests The Band Perry and Brett Eldredge, met at the Grand Ole Opry House to film “American Saturday Night Live from the Grand Ole Opry.” The feature-length movie is expected to be in theaters in winter. Camera crews captured performances as well as backstage footage to give moviegoers a front-row seat to the show, as well as insight into the personalities and relationships that help make country music unique. “It’s like a mega behind-the-scenes version of The Opry,” The Band Perry’s Reid Perry explained of the movie. “I’m excited for the movie to come out because, to me, one of the coolest things we’ve got to be a part of as The Band Perry is being backstage at the Opry,” said Kimberly Perry from the band's dressing room. New music was a trend in the show. In addition Paisley played his new single, “Country Nation,” along with various hits, including "American Saturday Night," and Rucker performed album cut “So I Sang,” which he said backstage he hoped would be on country radio at some point. After rehearsals Paisley said he was “so excited to be asked” to be in the movie.